Moulded by history and major artistic trends ever since Antiquity, Rome offers up its ancient treasures to visitors in search of wonder. The Eternal City boasts countless works of art, iconic archaeological sites, baroque churches and stunning monuments, set against a backdrop of lush green gardens, irrigated by water from the River Tiber. “Everything is astonishing in Rome”, as Stendhal observed in the early 19th century. And above all, in Rome you'll find an urban atmosphere unlike anything that you will find elsewhere in the world. 28 centuries of heritage still feed into this city of ancient ruins, Italian Renaissance ‘palaces’, fountains, baroque churches and medieval alleys which climb around its 7 hills. Legend has it that everything began on Palatine Hill, the birthplace of this incredible open-air museum. The city's masterpieces, the Roman Forum, the Trevi Fountain, the columns of the Pantheon, and the baroque Piazza Navona, defy the ravages of time and cannot fail to inspire emotion. And the ultimate symbol of the Colosseum, the start and ending point of the Rome Marathon, is a majestic demonstration of the exceptional character of this amazing European capital. From the Janiculum, north of Trastevere, a fashionable, charming neighbourhood with its labyrinth of colorful streets, the view of the city, studded with steeples, is absolutely breathtaking. There’s a very good reason why it’s known as the “city of a thousand churches”. Witness to the birth and then the rise of the Catholic Church, Rome is also home to the Vatican City. Its Sistine Chapel and St Peter’s Basilica house priceless works of art, demonstrating the artistic heritage of the Italian renaissance. Michelangelo, one of its main craftsmen, left the memory of his genius in the capital, redesigning the architecture perched atop the Capitoline Hill. The ‘palaces’ of the smallest of Rome’s hills now house the Capitoline Museums, whose collections rival those of the Borghese Gallery, nestled in the enchanting gardens of the Villa Borghese. These gardens are home to a number of cultural institutions in a city that has always celebrated the arts, with renowned festivals including Fotografia, Romaeuropa Festival and Rome Film Fest. When it comes to film, Rome has been immortalised on the big screen many times. Explore Via Veneto to find the setting and atmosphere of Fellini’s Dolce Vita: you can still experience the Roman way of life here today. The historic street bustles with life and is constantly reinventing itself to keep ahead of the latest trends. Follow in the footsteps of elegant Romans through the Art Nouveau glass of the Galleria Alberto Sordi, and into the luxury boutiques on Via dei Condotti. Milan may well be the Capital of Fashion, but Rome is inextricably linked to the history and development of the big names in haute couture. If there’s one area where Romans don’t veer too far away from tradition, it’s food. Home to many Michelin stars, Italy’s capital has plenty of wonderful restaurants to choose from, each one defending the international reputation of a culinary culture that is proud of its amazing diversity. Rome brings together the opulence and generosity of the country’s different regions. White truffle from Alba, Burrata from Puglia, Limoncello from the Amalfi Coast... Like rough diamonds, the ingredients are on display in the stalls of the Campo dei Fiori market, before they are snapped up by the trattorias or traditional restaurants in the old Jewish ghetto. Rome also comes to life in its chic cafés where the espresso is king. The end of the day doesn’t mean the end of fun in Rome. In the picturesque, popular neighbourhood of Testaccio, there are stylish bars and clubs to choose from to sip an aperitivo and watch the sun go down behind the ancient columns of the Eternal City, a destination that’s bound to live up to its nickname. Having opened its doors in 1938, Caffè Sant’Eustacio is a local coffee institution in Rome which nestles in the colossal shadow of the Pantheon. Savour the aroma of freshly roasting Arabica beans while enjoying a classic espresso or a gran caffè accompanied by a delicious Italian sweet treat. At Rome’s Antico Caffè Greco, discover the iconic café where Byron, Keats, Mendelssohn, Ibsen and Casanova once sipped their coffee. The oldest bar in Rome, Antico Caffè Greco opened its doors in 1760 and oozes historic charm. Settle into a red velvet banquette with a café macchiato and soak in the literary history. Discover the famous espresso of Tazza d’Oro in Rome, where a handful of tables enjoy views across the ancient Plaza to the awe-inspiring Pantheon. Baristas in waistcoats and bowties expertly pour frothy espressos as eager coffee-lovers await their turn, in a setting boasting original 1940s fittings. Discover this unmissable Roman coffee experience. 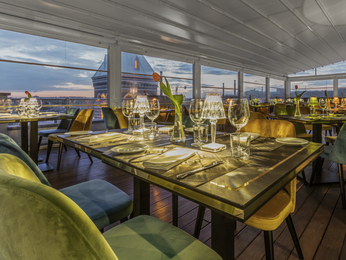 Offering breathtaking views of the Eternal City, the award-winning La Terrasse restaurant delivers magical sunsets and Mediterranean haute cuisine. 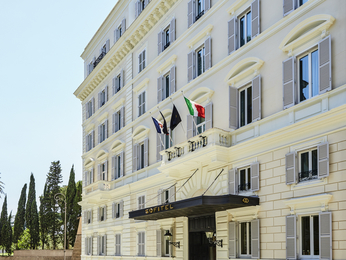 Set within the Sofitel Rome Villa Borghese, La Terrasse offers prime views of the dome of Saint Peter’s and the verdant Villa Borghese from its warm terracotta tiled dining terrace, shaded by a retractable roof for added comfort. By night, the city twinkles into life, creating a romantic backdrop for Chef Giuseppe D’Alessio’s sumptuous Mediterranean menu with a French twist, featuring flavours such as Mezzi rigatoni carbonara with seasonal truffle, lemon and chive risotto with red King prawns and zucchini blossoms, and roasted lamb chop Mediterranean style with vegetable and potato couscous. For the ultimate indulgence, opt for one of the superb degustation menus with wine pairings. Rome is a great city to visit all year around, since it offers a temperate climate without extremes of temperatures. The coldest months are December to March with an average temperature of 8-10°C and the hottest months are June to September with temperatures above to 20°C. Keep in mind that temperatures can climb up to 30°C in July and August. The best time to visit Rome is from May until June, and September to October, when the temperatures are warm with an average of 20° Celsius. The average number of rainy days is high in Rome compared for example to Paris. Rainfalls are generally at their highest from November to February. Transportation is easy to organise in Rome. Expect a wide range of methods of transportation, including: local cabs, private car services, rental car, metro, trains, trams, buses and bikes. Keep in mind that the historic city center is full of narrow streets which are not very welcoming for cars. Renting a vespa can be a great alternative if you feel comfortable driving one, otherwise you can also explore Rome’s city center by foot. Rome’s metro, operated by ATAC, only offers 3 lines: A (orange), B (Blue) and C (green), serving 73 stations, with Termini Station being the major metro station. ATAC also operates buses and trams which usually run from 5am until midnight. Bus lines 40 and 64 are very convenient since they cover St Peter’s square, Piazza Venezia, Piazza Navona, Campo de’ Fiori and Pantheon. Transport tickets are valid on all bus, tram and metro platforms: a single ticket is 1.50€ and a daily pass is 7€. They can be purchased at the stations’ vending machines or at newsstands throughout the city. Keep in mind that when driving in Rome, you must drive on the right side of the road. Licensed taxis in Rome are white and have a sign with “taxi” on their roofs. Taxi can be hailed on the street, found at taxi ranks or booked in advance through one of the several Rome taxi companies. The initial charge is 3€ from 6am to 10pm, 4.5€ in the evening and 6€ on weekends and then add 1.10€ for each kilometer. Some additional charges may apply. Credit cards are rarely accepted and an additional charge fee may apply. Fiumicino Airport (Leonardo da Vinci) is located 30 kilometers from the city center. Expect a 40 minutes journey and a fare of 45€ (depending upon traffic and the time of day). The Leonardo train Express is the fastest travel option between Fiumicino Airport and the city center. Departing every 20 minutes, the journey will take you 30 minutes and the fare is 14€. Another option from Fiumicino to Termini station, in the center of Rome, is by taking the Terravision bus. The journey takes approximately one hour and the fare is 4€. Ciampino airport is dedicated to low-cost airlines and is located 16 kilometers from the city center. There are 3 bus companies taking you to Rome’s city center. Expect a 40 minutes journey and a 4€ fare. Another alternative is the metro line A.
Metered taxis are available and private transfers can be arranged at the airports.